Look for accessories that are in line with your personal style as well as the look and feel of your wedding. A sweet starfish hair comb or orchid flower is perfect for the barefoot beachy bride. A classic style is perfect for the minimalist or timeless bride. More of a romantic or boho bride...a beautiful handmade design would be just perfect! The most important aspect of your overall wedding look is your wedding dress. The dress is going to set the style for your whole look. If your dress is more simple with no embellishments, it leaves you more open in choosing any type of accessories. If your dress has more detailed embellishments, you will want to take this into consideration when choosing accessories. The color of the dress is also a consideration when choosing bridal hair accessories that also have color such as colored jewels, lace or fabric. Gold Bridal Hair Accessories are more popular than ever before but many brides are confused as to whether they should go for the gold! The general rule of thumb is that gold is going to flow best with an ivory, offwhite or champagne dress and make sure to stay consistent and if you are wearing gold hair accessories, make sure your bridal jewelry is gold as well. Gold accessories look stunning with any hair color or complexion so whether you are a blonde goddess, a dark beauty or a ravishing redhead...gold will work for you, don't worry! Bridal Hair Comb or Clip - Hair combs are by far the most popular choice among brides. With so many different styles to choose from it is easy to find something that fits in with the style of your wedding and your personal style. Combs work best accenting an updo in the back or side of the head but can also be worn with hair down and swept to the side. Headband or Tiara - A headband or tiara can create a beautiful classic look or a dramatic statement depending on the style. Choose a dainty understated look for a more traditional style or a blinged out glamorous look if you want to make a statement. Headbands and tiaras can work great with any style hair including an updo hairstyle, all down bridal hair or a half up half down look. 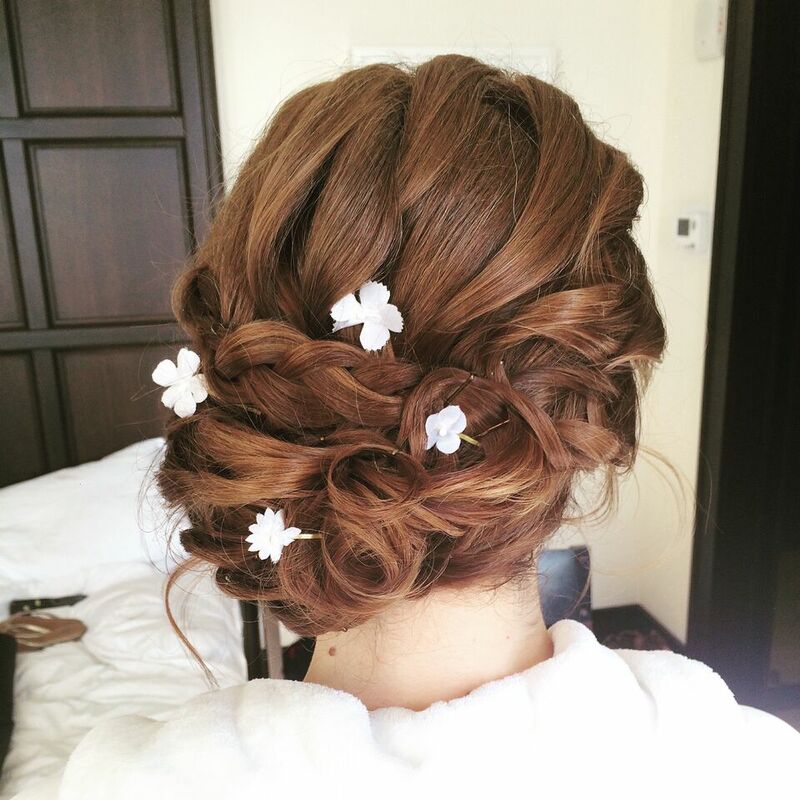 Hair Flowers - You can't get more romantic than a beautiful bridal hair flower. Choose a simple hair flower for a casual garden or backyard wedding or opt for a beautiful embellished look for a more elegant look that is still soft and romantic. Hair Vines - The newest trend in bridal hair accessories is definitely the bridal hair vine. Perfect for a romantic or boho chic look, hair vines can be bent and manipulated into different shapes to accent any hairstyle. Twist a hair vine in the back of a soft braided updo, around a bridal bun, on the top of your head like a headband or for an even more dramatic look, hair vines can be worn across the forehead! Hair Pins - If you are looking for a very simple understated look, hair pins are perfect. Best in an updo or half up half down hairstyle, sprinkle hair pins across your style for a variety of looks. The second thing to take into consideration is your wedding day hairstyle. Will you be wearing a bridal updo, all down hairstyle or half up half down? It is best to choose your hairstyle first and then add your accessories to compliment the style. Another thing to take into consideration is your hair type. If your hair is on the finer side, you will want to stay away from heavier metal pieces that might not stay well in your hair or weigh it down. Just can't make up your mind? You don't have to....just change it up! Many of our affiliate bridal stylists tell us that their brides are really having fun with their look and changing their accessories, their hairstyles and sometimes even their dress between the ceremony and reception. Go from a beautiful all down hairstyle to a fun, sassy updo or vice versa, start with an elegant updo and then release your style to reveal your long flowing locks. Word of advice though, if you are planning on a style change it is best to make the investment of having your stylist stay to help you! You have found the ideal dress, an amazing hairstyle and the perfect hair accessories...now it is time to pull it all together with your bridal jewelry. Like I mentioned before, best to stay with the same color metal when matching your jewelry and accessories. You will also want to look for jewelry with the same elements as your hair accessories whether that be rhinestones, pearls or a combination of both. If you are wearing a hair accessory that shows from the front such as headband or hair vine, keep your jewelry to a minimum maybe opting for a pair of earrings and maybe a bracelet. If your hair accessories are in the back of your hair then a beautiful necklace and earrings may be the perfect accent. Just completely stuck and have no idea what direction to go??? Ask for help but remember to ask someone whose style advice you believe in! 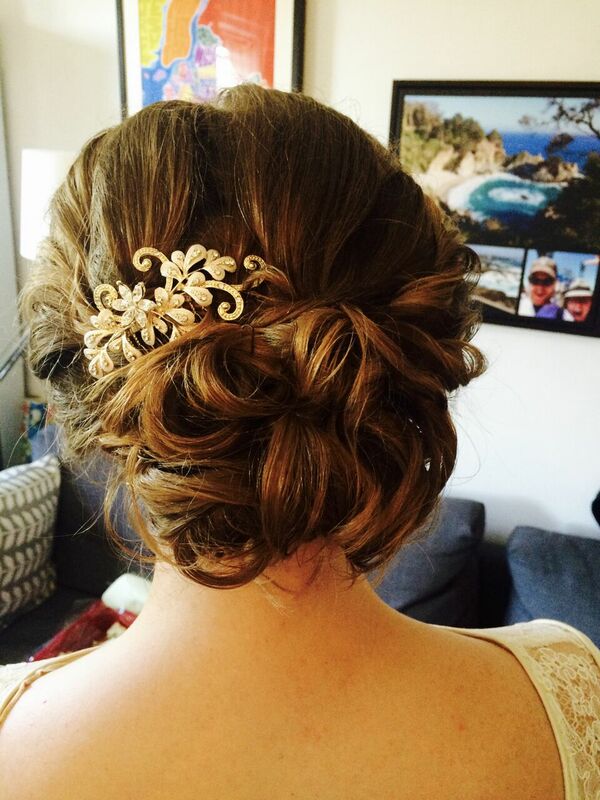 Your bridal stylist is the perfect person to turn to when you are undecided about your hair accessories. 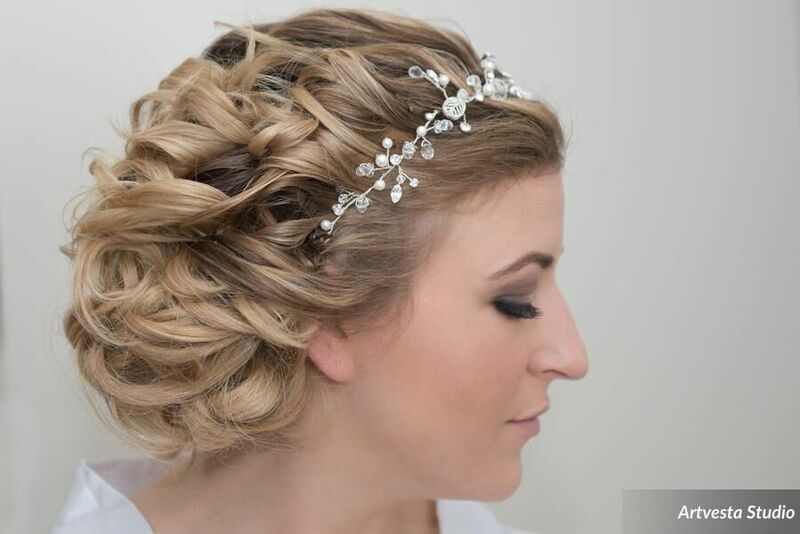 Many of our bridal affiliates carry a selection of hair accessories to use at the preview so that you can see exactly what the style will look like before you commit. We saved the most important piece of advice for last and that is to stay true to yourself and your personal style. Don't worry about being the "perfect" traditional bride and certainly don't worry what anyone else thinks you "should" or "shouldn't" do (even your mother)! This is your day and you should feel your most beautiful and your most authentic on this day more than any other! The bottom line is there really are no rules except for one, to do what makes you happy...period!! !